The weather was kind to us, although the unfavourable forecast probably reduced the crowd somewhat, and we saw bigger crowds than last year, more colourful and tuneful protestors and a real sense that the voices of opposition have more momentum that the frackers themselves. 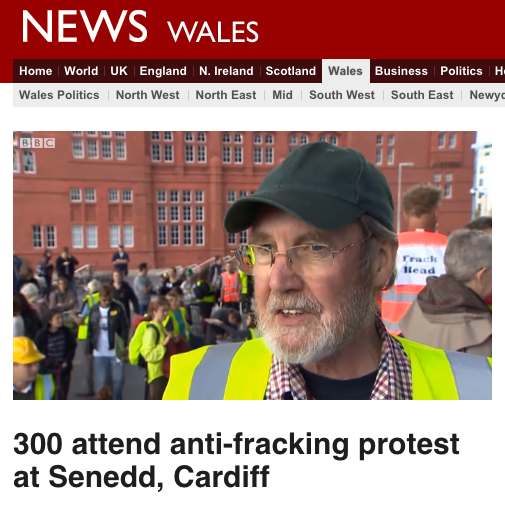 We even had the clearest and most unambiguous opposition to fracking to date from a Labour AM – take a bow Mick Antoniw. But the real stars were the fractivists themselves. 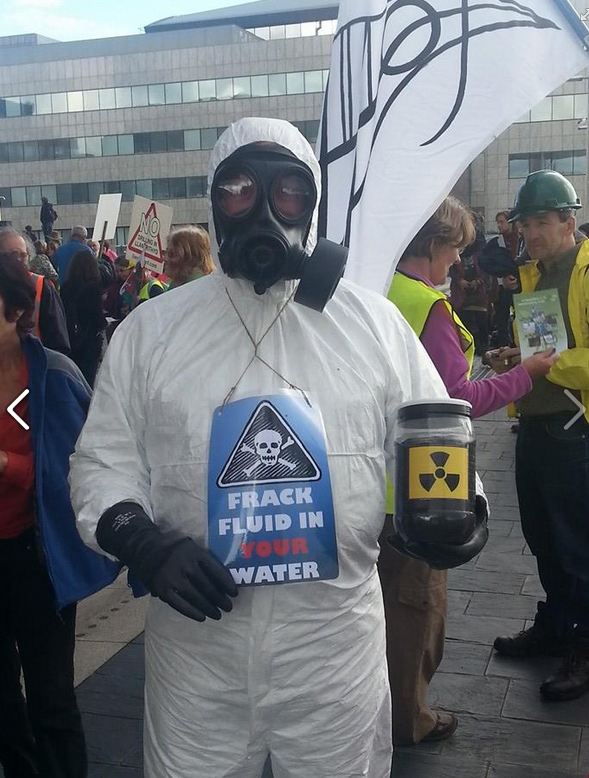 Richard Cockle – Frack Free Llantrisant – was a star turn and in demand for photos! 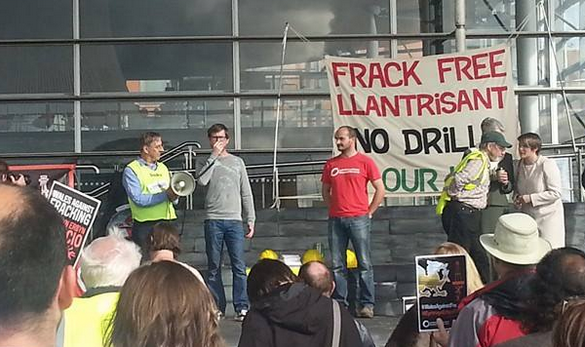 Keith later chaired the Frack Free Wales Coalition meeting which I found very encouraging too. Every meeting sees new people and new groups emerging. It was great to have new people from Brecon and Caerphilly this time. The meeting was productive with lots of feedback about what Frack Free Wales can do to further its support work for the local groups and activists. A strong message for me was that, with good representation from regions not directly threatened, as far flung as Aberystwyth and Machynlleth, we are reaching a phase in the campaign where it is not just the NIMBY’s seeing the relevance of this issue. We can reach out to anyone with an interest in a more sustainable future for everybody. This will sustain the movement and see it continue to grow, as people are joining and getting involved knowing it is a long haul battle, but a battle people know simply has to be won. Four years ago I felt like a lone voice in a big empty void, but now I am surrounded by an ever-growing organic community that will continue to grow and flourish and, I believe, will lead us not just to victory over the filthy frackers and their filthy money, but to a whole new world of community energy initiatives. We are seeing the first seeds of this being sown in the Vale, and it is the logical extension for this community of people to focus on in the peaceful times once the war against the frackers is won. This entry was posted in Uncategorized on October 11, 2014 by Bridgend's Green Leftie.